Tupperware rice cooker - great used condition. HERE WE HAVE A TUPPERWARE ORANGE MULTI SERVER MAGIC. A FAIR FEW MARKS AND SIGNS OF AGE BUT OVERALL GOOD CONDITION. GRAB A BARGAIN! 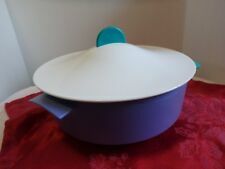 Fantastic Vintage Tupperware steamer, does perfect rice and pasta every time, as well steaming anything and everything you want to. This is in an unusual colour combination of the burnt orange base, usual creamy white steamer section and a blue lid. Like all Tupperware, it just goes on and on, and I seem to have accumulated about 4 of these now! I don't need that many, so selling this one. Good clean but used condition. Will be well packed for postage and sent signed for. Please ask if you have any questions. New Tupperware Rice Cooker 8 Cups For Microwave Light Pink . Condition is New. Shipped with USPS Priority Mail. I am human and can miss things. I got you covered! This is for your protection and ours. Just not fair. If you are buying a used item it may have scratches and scuffs. We do our best to note any issues we see but we are human so take a look at Pics. Small wear on the inside red piece. This has 3 pieces and is in good condition! This is so versatile and is perfect for so many things. I even cooked shrimp in one of the ones I had! (Not this one!). I promise. VINTAGE TUPPERWARE RICE COOKER INSERT - 9 1/2" X 6 3/4"
However, we can and do make an honest mistake. We ARE human. Let's be civilized and nice human beings. We cannot fix a problem if we do not know about it. This sale is for a NEW Tupperware Microwave Rice Cooker MINI. 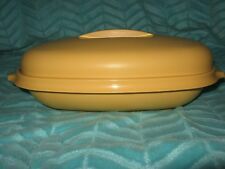 Tupperware small microwave rice cooker. I use it to cook 1 cup of rice. Great for dorm rooms or personal servings. 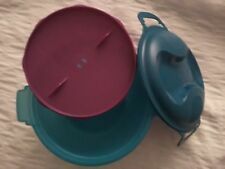 TUPPERWARE 3 PC. MICROSTEAMER MICROWAVE STEAMER COLANDER RICE COOKER #3066A 8.5"
UP FOR SALE IS A TUPPERWARE 3 PC. MICROSTEAMER. MICROWAVE STEAMER / COLANDER / RICE COOKER. #3066A. 8.5" ACROSS. EXCELLENT GENTLY USED CONDITION. 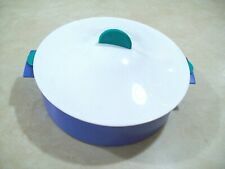 VINTAGE TUPPERWARE RICE COOKER LID - 10 1/2" X 7 1/4"
They then send it on to the state of. Pennsylvania and. This is a brand new 3 piece Tupperware rice cooker with directions. This sale is for a NEW Tupperware Microwave Rice Cooker.